I loved Christmas time in the newsroom. So many, many goodies from all over the place. I kept tons of my old files and health “props” in the big drawers underneath the “cake” counter in the old newsroom. I cannot tell you all the crumbs, frosting bits, greenish chocolate chips, petrified salsa goo, nasty science project foodstuffs I would find down in those drawers. Oh, the good old days. Just the free food part sounds good to me now! How about Cal Callaway’s going away cake? A black and gold cookie cake with a big GT on it, all for a die hard Bulldog fan. Oops. Wow. A mention on your blog is probably the best PR anyone’s ever gotten from sending food to a newsroom. Marietta Diner for the win! Terrorism be damned, we newsies will eat anything free left in the newsroom. I once watched two photogs wrestle on the floor for dibs on that last donut in a Krispy Kreme box — the origin of which was unknown and uninvestigated. Now if you’ll excuse me there’s an old ketchup packet in my desk drawer that demands my attention. News people will eat anything that’s free. I am legend for my affinity for all things sweet and gooey on the Assignment Desk. Even a live report in progress on some live apartment fire type event didn’t stop me from walking up behind Suchita Vadlamani one morning and grabbing the last chocolate covered Krispy Kreme from the desk while she imparted the latest details of the ongoing story. (A video of that live shot snack still circulates). I also achieved some measure of notoriety in the newsroom when I sampled a particularly crunchy loaf of bread that had been in a Good Day Atlanta cooking segment. It was only after a couple of bites that I found out the loaf had been shellacked so it would look pretty on TV. 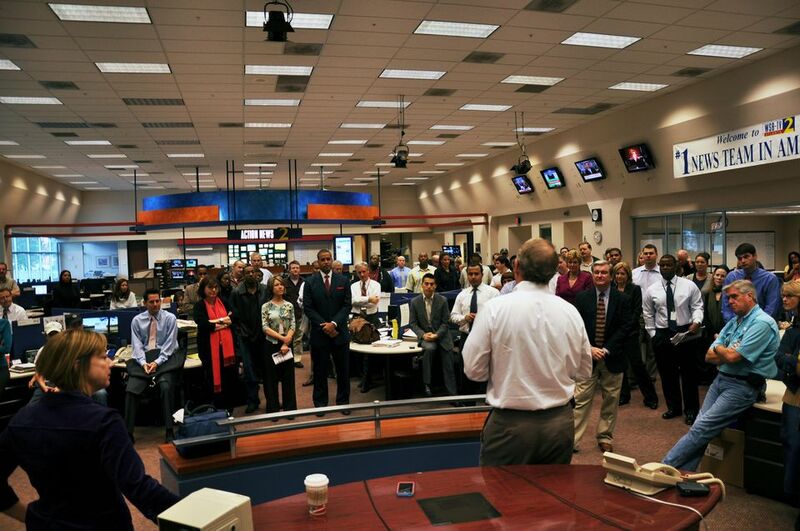 If some miscreant wants to wipe out a newsroom, all they need is a poisoned pie. As my newsroom knows, I always ask when there’s food in the newsroom where it came from. It’s based on something that happened at WSOC in Charlotte back in the 80s. We had a sports guy named Harold Johnson. Viewers loved him and they would send him food, etc. One day he put brownies out that a viewer sent in. They were devoured, but many folks paid the price. The brownies had ex lax in them. To this day I remember how everyone after that wanted to know the source of the treats. When in doubt, don’t eat. But, the ST was a rad throwback! Thanks! Every Monday night at WGCL was cake night, where a pool of 20 people rotated bringing in cake. I found out about it just before my internship ended. Nevertheless, I brought in a white chocolate mousse cake from Metrotainment Bakery. It’s a good thing they moved from their 14th street location – at $3 a slice, it was hard NOT to eat cake every day of the week. Paramecium? Isn’t that a song that Tom Corvin wrote? Oh wait. Never mind, his song was Ameoba. I’m getting my unicells mixed up. I recall a particularly funny intercom announcement in the WAGA newsroom announcing the hope that whoever grabbed a “cookie” off a reporter’s desk really enjoyed the dog biscuit. Oops. I remember making that announcement. We had some treats for dogs that looked just like pastries to be used in the morning show and someone decided to treat him/herself to a handful of them. Oddly enough, Moe’s Southwest Grill delivered a taco/burrito lunch to Charlotte newsrooms today…ours arrived at 8AM. They were introducing a new line of “not as big as a Volkswagon” burritos and were giving food away (to the public as well as the media). Nothing like the pungent odor of sterno to get the old morning meeting rolling. Fortunately…there was no “Harold Johnson Surprise”….